Justice League #13 provides another example of how infuriating many of the New 52 books by Geoff Johns have been. Like Johns' Aquaman, this issue offers us a look at a larger DC Universe while at the same time offering us surprising little insight into that universe. While this issue does offer several good bits of character business, it is icing on a bland cake. The main plot focuses upon the League's attempts to capture The Cheetah - once again the closest thing to an arch-enemy that Wonder Woman has. Her background has changed slightly, with archeologist Barbara Minerva now having been a one-time ally of Wonder Woman who became possessed by a goddess of the hunt after accidentally cutting herself with a ritual knife belonging to a lost tribe in the Amazon jungle. Why she took the name of an African predatory cat when her powers come from a South American goddess is not explained. As always, Johns is at his best when he forgets the story and focuses on making his characters characters. The best moments in this issue are the little scenes where the heroes are allowed to be people. The awkward moment when Wonder Woman and Superman discuss the kiss they had in the heat of the moment last issue. Barry Allen's reassuring Victor Stone that he is still more man than machine as the two discuss the recent shake-up of their teams. And the real prize of this issue - a back-up story co-written with Animal Man writer Jeff Lemire, in which we see Steve Trevor and Oliver Queen discussing evidence Green Arrow found that a covert super-villain team exists. The art is largely excellent. Tony Daniel, fresh from Detective Comics, does a fine job of rendering the action of the main story, with savage pencils defined by the inks of Richard Friend & Batt. 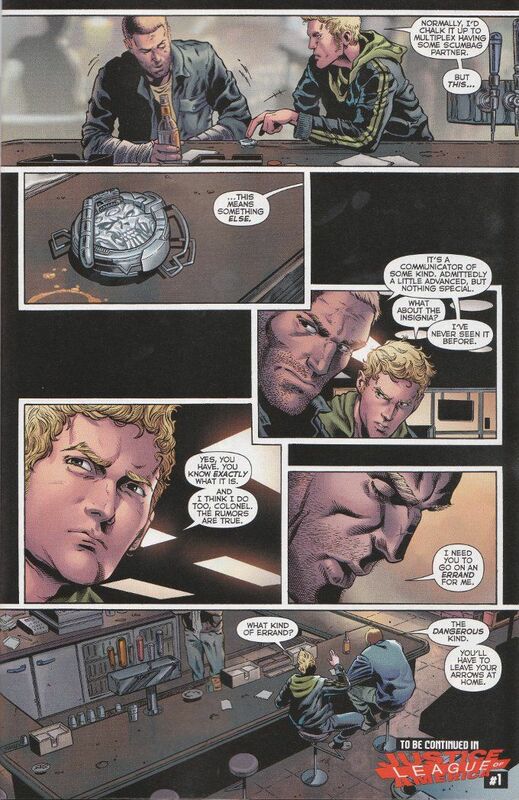 Less memorable is the back-up story drawn by Brad Walker, whose Oliver Queen looks far-too baby-faced for my liking and indeed seems to look like a young boy in some panels! Ultimately, the biggest problem with Justice League is that it fails to seem like the flagship title of the company. Everything here is competent but Justice League should be more than that. It should be amazing - an action movie on paper! And this... this just isn't that exciting or enthralling.